Background Cure rates for chronic hepatitis C have improved dramatically with direct-acting antivirals (DAAs), but treatment barriers remain. We aimed to compare treatment initiation rates and barriers across both interferon-based and DAA-based eras. Methods We conducted a retrospective cohort study of all patients with chronic hepatitis C seen at an academic hepatology clinic from 1999 to 2016. Patients were identified to have chronic hepatitis C by the International Classification of Diseases, Ninth Revision codes, and the diagnosis was validated by chart review. Patients were excluded if they did not have at least one visit in hepatology clinic, were under 18 years old or had prior treatment with DAA therapy. Patients were placed in the DAA group if they were seen after 1 January 2014 and had not yet achieved virological cure with prior treatment. All others were considered in the interferon group. Results 3202 patients were included (interferon era: n=2688; DAA era: n=514). Despite higher rates of decompensated cirrhosis and medical comorbidities in the DAA era, treatment and sustained virological response rates increased significantly when compared with the interferon era (76.7% vs 22.3%, P<0.001; 88.8% vs 55%, P<0.001, respectively). Lack of follow-up remained a significant reason for non-treatment in both groups (DAA era=24% and interferon era=45%). An additional 8% of patients in the DAA era were not treated due to insurance or issues with cost. In the DAA era, African-Americans, compared with Caucasians, had significantly lower odds of being treated (OR=0.37, P=0.02). Conclusions Despite higher rates of medical comorbidities in the DAA era, considerable treatment challenges remain including cost, loss to follow-up and ethnic disparities. It is important to understand treatment barriers and issues in our linkage to care with newer highly efficacious direct-acting antiviral (DAA) therapies. While there are several published papers on barriers and treatment rates for interferon (IFN)-based therapies, there is a lack of data on treatment barriers and reasons for non-treatment in this DAA era. Treatment rates with the newer DAA therapies more than tripled as compared with rates in the IFN era. However, despite this dramatic increase in treatment rates with DAAs, there remains considerable treatment challenges including both systems-level and patient-level factors including loss to follow-up and insurance/cost issues. In addition, there were significant healthcare disparities: African-Americans, compared with Caucasians, had significantly lower odds of being treated. Improving patient-level and systems-level factors to better identify patients with chronic hepatitis C (CHC) and ensuring patient follow-up is now even more important to extend the impact of DAA therapies and eradicate CHC. However, as these more efficacious treatments become the standard of care, it is increasingly important to study treatment barriers and issues in our linkage to care. While there are several published papers on barriers and treatment rates for IFN-based therapies, there is a lack of data on treatment barriers and reasons for non-treatment in this DAA era.1 4 5 8–11 Thus, we conducted a longitudinal retrospective cohort study of patients seen at an academic hepatology clinic to determine how treatment rates and barriers have changed as we transitioned from hepatitis C IFN-based to all oral DAA-based therapies. We studied consecutive patients with CHC seen at a subspecialty hepatology clinic affiliated with Stanford University Medical Center from 1999 to 2016. Patients were electronically identified to have CHC via International Classification of Diseases, Ninth Revision, Clinical Modification (ICD-9-CM) code query. The codes used included: 070.44, 070.54, 070.70, 070.71, 070.41 and 070.51. Manual chart review was then performed to validate CHC diagnosis, and a patient was considered to have CHC by laboratory report of positive HCV antibody or HCV RNA and/or a documented history of CHC by a physician. Patients were excluded if they did not have a history of at least one visit in hepatology clinic, were under 18 years of age or had received prior treatment with DAA therapies. The following sociodemographic data were collected: year of birth, race/ethnicity (Caucasian, black, Hispanic, Asian) and gender. Additional medical, psychiatric, and liver-related comorbidities for each patient were queried by ICD-9-CM code and included diabetes mellitus, chronic kidney disease, coronary artery disease, chronic obstructive pulmonary disease, depression, bipolar disorder, schizophrenia, chronic hepatitis B, cirrhosis, decompensated cirrhosis and hepatocellular carcinoma (HCC). All patient medical and psychiatric comorbidities and baseline laboratories were obtained at baseline and up to 1-year postbaseline. Treatment data during both IFN and DAA era were manually abstracted and were defined by the initiation of any therapies approved for antiviral use by the US Food and Drug Administration during the study period. The therapies included: IFN-based therapies, ribavirin (RBV), first-generation DAAs telaprevir and boceprevir and second-generation DAAs including simeprevir, sofosbuvir, daclastavir, ledipasvir, velpatasvir, elbasvir, grazoprevir, ombitasvir, paritaprevir, ritonavir and dasabuvir with or without RBV. The date of 1 January 2014 was chosen for the DAA era as this was the first date that DAAs were available at our medical centre for treatment. Therefore, patients were included in the DAA era if they had at least one visit on or after 1 January 2014 and had no treatment prior to this date or were treatment non-responders or relapsers with IFN-based therapies prior to 1 January 2014. The remaining patients were grouped in the IFN era. SVR was defined as an undetectable HCV viral load 24 weeks post-treatment in the IFN era and an undetectable viral load 12 weeks post-treatment in the DAA one. Based on recommendations from the American Association for the Study of Liver Diseases (AASLD), patients were considered to be ineligible for IFN therapy if they had laboratory results indicative of decompensated cirrhosis baseline total bilirubin >1.5 g/dL, international normalised ratio >1.5, albumin <3.4, platelet count <75 000, haemoglobin <13 g/dL for men and 12 g/dL for women, neutrophil count <1500 mm3 or serum creatinine >1.5 mg/dL.12 In order to be considered lab ineligible for IFN therapy, subjects were required to have the abnormal lab value(s) for at least 3 months. Patients were also considered ineligible for IFN-based therapy if they had major uncontrolled depressive illness as documented in the physician notes, a history of solid organ transplant, autoimmune hepatitis, uncontrolled medical comorbidities or a known hypersensitivity to antiviral medications. According to the AASLD guidelines, we considered all patients eligible for therapy in the DAA era except those with a limited life expectancy not correctable by HCV treatment or liver transplantation.13 All data were manually abstracted for patients who were not treated but otherwise were considered treatment eligible. We measured as a secondary endpoint a delay of prescription fill that was defined as greater than 3 months of time between the prescription for HCV treatment and when the patient filled the prescription for the DAA era. Baseline demographics and characteristics were reported as mean and SD for continuous variables and proportions for categorical variables. The χ2 test was used to analyse categorical variables and t-tests for normally distributed continuous variables and Mann-Whitney U test for non-normally distributed continuous variables. Fisher’s exact and the Mann-Whitney U tests were used to compare non-parametric categorical and continuous variables. A two-tailed P value of ≤0.05 was determined to be statistically significant. Univariate and multivariable logistic regression analyses were used to determine predictors for treatment. Two separate regressions were performed: one for the patients of the IFN era and one for those of the DAA era. All analyses were performed using STATA V.14. We queried a total of 12 486 patients with CHC by ICD-9-CM coding who were seen at Stanford University Medical Center (figure 1). Based on chart review, 2998 patients were excluded as they did not have documented CHC, and an additional 6261 patients were excluded as they were not evaluated in the hepatology clinic. Five patients were excluded who were under the age of 18 years, and 20 patients were excluded due to prior treatment with all-oral DAA therapies at other institutions. A total of 3202 were included in this study: 2688 patients in the IFN era and 514 patients in the DAA era. Patients in the IFN era were followed in clinic for a median of 54 (range 0–82) months and in the DAA era 49 (range 0–223) months. Study flow diagram. A total of 3202 patients were seen in subspecialty hepatology clinic: 2688 patients in the IFN era and 514 in the DAA era. CHC, chronic hepatitis C; DAA, direct-acting antiviral; ICD-9, International Classification of Diseases, Ninth Revision; IFN, interferon; SVR, sustained virological response. Compared with patients in the IFN era, those in the DAA era trended towards older age (mean age 55.7±8.3 years in the DAA era vs 54.9±10.8 years in the IFN era, P=0.1). In the total cohort, 52.6% were Caucasian, 21.8% were Hispanic, 14.3% were Asian, 6.2% were African-American and 5.1% were of other ethnicity. Patients in the DAA era had higher rates of medical comorbidities including coronary artery disease (14% vs 9.2%, P<0.001), chronic kidney disease (25.5% vs 12%, P<0.001), chronic obstructive lung disease (5.3% vs 2.6%, P=0.001), diabetes mellitus (37% vs 19.7%, P<0.001) and psychiatric disorders (47.7% vs 34.4%, P<0.001). Patients in the DAA era also had higher rates of cirrhosis (84.8% vs 63.8%, P<0.001), and higher rates of decompensation (75.7% vs 45.1%, P<0.001) including HCC (41.3% vs 18.8%, P<0.001). There were similar rates of hepatitis B coinfection in both groups (4.5% in the DAA-era vs 4.7% in the IFN era, P=0.15). Most patients had HCV genotype 1 (69.5%), 2 (12%) or 3 (13.1%). A smaller proportion of patients had HCV genotype 4 (2%) or 6 (3.3%). In the DAA era, when stratifying patients by ethnicity (n=485 with known ethnicity), African-Americans had the lowest rates of decompensated cirrhosis (44% of African-Americans compared with 71.6% of Caucasians, 82.1% of Asians and 90.9% of Hispanics) (online supplementary table 1). Rates of HCC were highest in Hispanics (40.4%) and African-Americans (24%) and lower in Asians (20.5%) and Caucasians (12.7%). Rates of medical comorbidities were similar between ethnicities. Both treatment and SVR rates were significantly higher in the DAA era compared with that of the IFN era (treatment rate: 77% vs 22.3%, P<0.001; SVR rate: 88.8% vs 55%, P<0.001) (table 1). In the DAA era, most patients received combination treatments with ledipasvir and sofosbuvir (43.4%), simeprevir and sofosbuvir (24.6%) or sofosbuvir and RBV (16.2%). About one-third of patients (125 of 394 patients, 31.7%) received RBV as part of their treatment course. By ethnicity, in the IFN era, treatment rates were highest in Asian Americans (25%) and Caucasians (24%), lower in African-Americans (21%) and lowest in Hispanics (16%, P=0.004) (online supplementary figure 1). In the DAA era, where treatment rates increased for all ethnicities overall, rates for African-Americans (60%) remained lower than that of other ethnicities (81% for Caucasians, 78% for Asians, 74% for Hispanics, P=0.065). The overall effectiveness of the antiviral therapies increased significantly with the introduction of DAAs (figure 2). 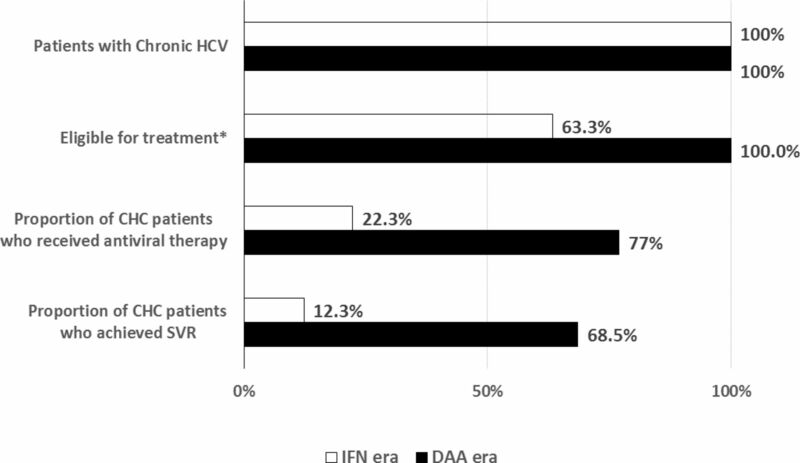 Of all patients with CHC seen in hepatology clinic, 12.3% in the IFN era and 68% in the DAA era achieved SVR. Treatment effectiveness by era. Treatment effectiveness by time period. Of all patients seen in a subspecialty hepatology clinic, 22.3% (white bar) of patients in the IFN era were treated and 12.3% achieved SVR. Seventy-seven per cent (black bar) of patients were treated and 68.5% achieved SVR in the DAA era. CHC, chronic hepatitis C; DAA, direct-acting antiviral; IFN, interferon; SVR, sustained virological response. Within the IFN era, the major contributing reasons for lack of treatment in otherwise treatment eligible patients were loss to follow-up (45.1%) and patient choice not to be treated (41.2%) (online supplementary figure 2). A smaller proportion of patients were not treated due to insurance or financial difficulties (11.8%). In the DAA era, the most common reason for lack of treatment was management of other active, potentially life-limiting comorbidities (42%) (figure 3). These comorbidities included both medical (active malignancies, depression, end stage renal disease, and recurrent pneumonia) and liver-related (HCC and severely decompensated cirrhosis) reasons. Approximately one-quarter of untreated patients were not treated due to issues with follow-up (24%). Eight per cent were not treated due to insurance or financial difficulties. Reasons for lack of treatment in the DAA era. In the DAA era, the most common reasons for lack of treatment were the management of other life-limiting comorbidities (42%) and issues with follow up (24%). DAA, direct-acting antiviral. In the DAA era, 63 of 394 (16%) treated patients had substantial treatment delays as defined by a time period of 3 months or longer from the prescription to the fill date (online supplementary figure 3). The most common reason for treatment delay was insurance related (52%), followed by delays due to active comorbidities and concurrent medication use (13%). A smaller proportion of patients had treatment delays due to a lack of financial stability (3%). We were unable to ascertain the reason for treatment delay in 22% of patients. Supplementary table 2 describes a multivariable logistic regression analysis for predicting treatment in the IFN era. Older age was a significant negative predictor for treatment with an OR of 0.97 (95% CI 0.96 to 0.98, P<0.001) per increase in year. Compared with Caucasians, Asian and African-American ethnicities were not associated with treatment; however, Hispanic ethnicity had lower odds of receiving treatment (OR=0.61, 95% CI 0.46 to 0.82, P<0.001). Compared with patients without decompensated cirrhosis, those with decompensated cirrhosis also had lower odds of receiving treatment (OR=0.59, 95% CI 0.47 to 0.73, P<0.001). The presence of two or more medical comorbidities was a predictor on univariate analysis (OR=0.71, 95% CI 0.51 to 0.98, P=0.039) but was non-significant when controlling for other factors on multivariable analysis (OR=0.9, 95% CI 0.82 to 1.2, P=0.54). Table 2 describes potential predictors of treatment during the DAA era. On univariate analysis, African-American ethnicity, compared with Caucasians as a referent, was a negative predictor of treatment (OR=0.35, 95% CI 0.15 to 0.83, P=0.02). There was a trend towards males, compared with females, predicting treatment as well (OR=1.4, 95% CI 0.92 to 2.1, P=0.1). On multivariable analysis adjusting for gender, African-American ethnicity (OR=0.37, 95% CI 0.15 to 0.88 vs Caucasians, P=0.032) remained a significant negative predictor of treatment. Hispanic ethnicity, compared with Caucasians, also had lower odds of treatment (OR=0.66, 95% CI 0.41 to 1.1); however, this did not reach statistical significance (P=0.09). Unlike the regression analysis for IFN-based therapies, decompensated cirrhosis and medical comorbidities were not significant predictors. 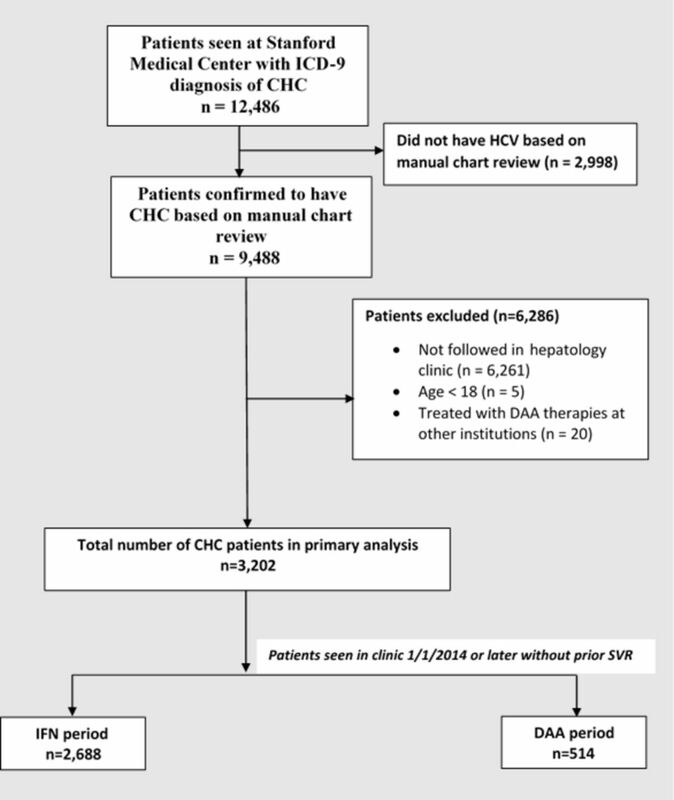 In this retrospective cohort study of 3236 patients with CHC seen at an academic hepatology clinic, we found that treatment rates dramatically increased with the introduction of DAA therapies. Treatment rates of the DAA era, compared with those of the IFN era, increased over threefold from 22.3% to 76.6% and SVR rates increased from 55% to 88.8% among treated patients. The overall treatment effectiveness within our population increased considerably as well; while only 12 in 100 patients were cured of HCV during the IFN era, 68 of 100 patients were cured during the DAA era. This is an especially significant finding for the use of DAAs as this is one of the first studies to be published on the use of DAAs in the patients with decompensated cirrhotic in the real-world clinical setting after the AASLD and Infectious Diseases Society of America (IDSA) guidelines recommended treatment should be considered for all patients with CHC. This finding further demonstrates that the recommendation can be followed in a safe and effective manner. In fact, in the IFN era, a history of decompensated cirrhosis decreased the odds of being treated with IFN-based therapy by nearly half (OR=0.59, P<0.001). Patients were also much less likely to refuse treatment. During the IFN era, approximately 41.2% of patients otherwise eligible for IFN chose not to be treated possibly owing to an overall lack of symptoms from the CHC combined with high rates of treatment toxicity of IFN-based therapies. It is important to note that in these studies, refusal rates were similar to older studies of IFN-treated populations.10 19 In contrast, only one person (<1%) in the DAA era in our study chose not to be treated. Despite these optimistic findings, significant barriers and disparities remain from the IFN to DAA era. Issues with patient follow-up remained a significant reason for non-treatment. Although rates appear to have decreased considerably from the IFN period (45.1% vs 28.1% in the DAA era), patient retention becomes much more important now that highly efficacious DAA therapies are available for all CHC patients. Financial or insurance barriers were also present in our study as to why treatment was delayed for the DAA era patients. These are not surprising findings as Younossi et al 20 in a large retrospective observational study, reported that patients’ delay in treatment was related to problems with finances and/or insurance. In this current study, African-Americans had much lower rates of decompensated cirrhosis than other ethnicities but had a disproportionately higher burden of HCC (supplementary table 1). While rates of decompensated cirrhosis and HCC in Caucasians were 71.6% and 12.7%, respectively, rates in African-Americans were 44% and 24%, respectively. Given their fewer symptoms, patients may have been more hesitant to start antiviral therapy, and providers may have been more reluctant to treat patients with HCC and especially those with more advanced disease. As we studied only patients evaluated in a subspecialty hepatology clinic, our findings may also underestimate the full impact of DAAs CHC’s total burden within the USA. First, as was apparent from our study, we excluded 65% of our population from primary analysis because they were not seen in our subspecialty hepatology clinic. Many of these excluded patients were seen for one time encounters (one time subspecialty surgery, single evaluation in the ER or single admissions on inpatient floors) without subsequent outpatient follow-up. Such a finding corroborates other recent studies in which the number of patients seen in a one-time setting such as the emergency room far exceeds the number of CHC patients seen in a subspecialty clinic.25 26 Linkage to care, as also seen in this study, is a large issue and needs further study to overcome this barrier to care. Second, our inclusion criteria did not capture patients who were at high risk for HCV but went undiagnosed for the presence or absence of disease. Chhatwal et al 27 report in their modelling study based on the National Health and Nutrition Examination Survey data that CHC will exert considerable healthcare and economic burden largely because of the undiagnosed population. As such, they estimate over the next 35 years, 320 000 patients will die, 157 000 patients will develop HCC and 203 000 patients will develop decompensated cirrhosis. In summary, the introduction of DAAs has significantly increased treatment and efficacy rates for patients seen at an academic hepatology clinic. Many patients considered ineligible for treatment with IFN-based therapies including those with decompensated cirrhosis are now easily treated with DAAs. However, despite the availability of DAAs, there remains considerable treatment challenges including patient retention and ethnic disparities. Improving patient-level and systems-level factors to better identify patients with CHC and ensuring patient follow-up is now even more important to extend the impact of DAA therapies and eradicate CHC. PN and PV contributed equally. Contributors PN, PV and MHN have conceived and designed this study. LAY and SW contributed in acquisition of data, queried the electronic data and identified patients appropriate for chart review. PN, JH, ST and LH collected individual patient information. PN, PV and MHN conducted analysed and interpreted the data. All authors drafted and/or revised the manuscript. All authors have approved this draft of the manuscript for submission. Competing interests MHN: grant/research support: Bristol Myers Squibb, Gilead Sciences, Janssen Pharmaceuticals and National Cancer Institute; advisory board/consultant: Anylam Pharmaceutical, Gilead Sciences, Dynax Laboratories and Intercept Pharmaceutical. Ethics approval This study was approved by the institutional review board at Stanford University. Data sharing statement Our dataset is available as a supplementary file in Excel format.